Acting as an entry point for the spring season, and as a closure for winter, Harmonics in Space by Fred Butler identifies with the emotional commonalities felt by many of us during the darkest months. Responding to seasonal affectations including lack of light and colour, Butler perpetuates an uplifting visual countenance to evoke positive feelings and remind us of the importance of mindfulness and living in the moment. In signature NOW gallery style, this exhibition is both immersive and interactive, including tactile and multi-sensory elements to engage visitors in a therapeutic and calming sensation. Faced with the task of working with the galleries unusual space, Butler worked alongside NOW gallery’s in-house curators to ensure this intriguing concept was executed with flair. Abi Buller speaks to Jemima Burrill, Cultural Consultant for NOW Gallery and artist Fred Butler to find out more. AB // How did the collaboration with Fred Butler and the NOW gallery come about? JB // We have always been great admirers of Fred’s work, in particular the multifaceted nature of her designs. She has an ability to use colour in such an exciting way and to put different materials together to create unexpected and beautiful objects. We wanted to really do justice to the work by showing it on a large scale. Our exhibitions are generally colourful and we knew that an installation by Fred would stand out like a beacon for audiences coming to Greenwich Peninsula. It was her aesthetic which appealed to us, as well as her philosophy of creating design that makes you feel good. AB // Can you describe the process from ideation to installation of the exhibition? JB // Fred came up with a very strong design for NOW Gallery which she brought to us as a beautiful model of the gallery space. 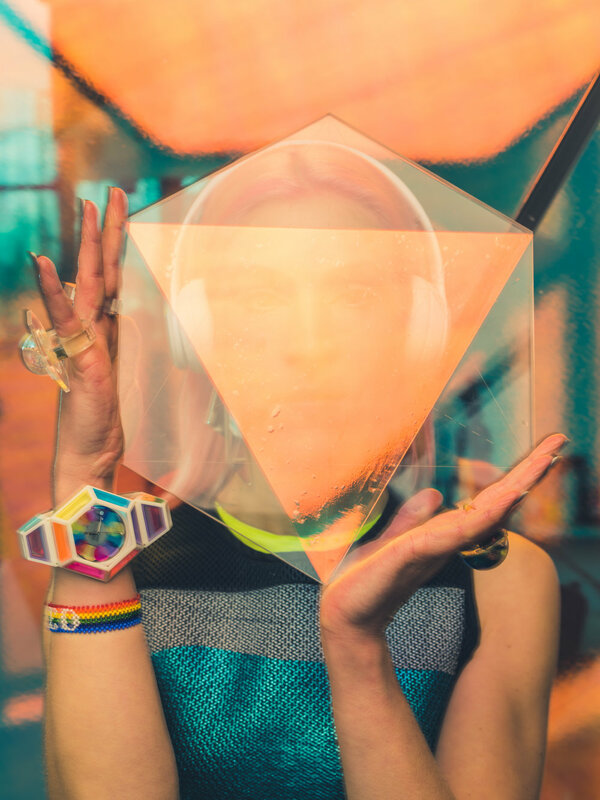 In this diminutive version we could see the potential of her brightly coloured tetrahedrons, the possibility for all to make bespoke origami shapes with the combination of healing light to get us through the winter months. This concept she developed with Lee Regan from Install Archive, to include standing and hanging pods with light, an iridescent entrance, and a soft pink and yellow foam floor. What is always a joy to see is the development of the different materials which start as samples and then seeing them reacting together on a large scale in the gallery. The iridescent panels, no longer just a rendering, have an unprecedented quality in the galley space. The process of development did not stop here as Fred is always thinking in the most holistic way. She has also added music composed by Natureboy which her audience can listen to on Beats headphones for a fully immersive experience. AB // How has this project differed from previous exhibitions at NOW gallery? JB // All of our projects are completely different. That is what is so exciting about working with such a varied collection of artists and designers who bring their own unique vision to the gallery. We have been so thrilled by the way the eccentricities of NOW Gallery have inspired such different approaches by different creatives. AB // Did you face any particular challenges with communicating the desired concept and exhibits within the space at NOW? JB // The concept for our NOW Gallery Commission is a clear one. We want a designer or artist to have the opportunity to create a piece of work that they would never ordinarily have the time, space or finances to do. The challenge is to introduce something which really fills the space - the gallery ceiling is 7m and there are no walls. It is putting an installation into a goldfish bowl with the large plate glass windows which surround the space. The interactive element has become an important element of our exhibitions, from Walala’s Maze, to Molly Goddard’s opportunity for all to sew on her huge elegant dresses. There is a feast for the eyes from outside the gallery and something fun to do within. People came from all over to draw their alter ego on Charles Jeffrey’s Ginger Roots. It is always a surprise to see the totally different and exciting concepts which are presented for the gallery. For Fred's exhibition everyone will have a chance to make a cosmic creature, an origami mascot in all different colours, to take home with them. AB // How did you ensure the exhibition space adhered to Fred Butler’s desire for the experience to be multi-sensory? JB // The gallery space designed by Marks Barfield has its own identity with wood and metal rods at its core which run along its ceiling. It is not a neutral space which means that artists have to have a big vision to fill it. Fred has made the gallery into a multi-sensory space with her use of fabulous materials, considering sound and by looking at how light works as a healing force within the space. AB // What have you learned about the gallery and curation processes from being a part of this project? JB // As someone who firmly believes in the power of colour and the importance of light, especially at this time of year (I even have a SAD light which I sit in front of every morning! ), I think that Fred’s holistic approach really taps into the importance of wellbeing in this sense. It also communicates how we can live our lives in the present. It is a perfect philosophy for NOW Gallery to adopt for our Winter/Spring installation, moving us forward to a lighter part of the year in a fun and inclusive way. As with all of our exhibitions, we are dealing with prototypes and the installations have never been done before so there are always elements which are risky and present new difficulties. Fred’s calm approach in the curation process has led to a great work environment where everyone creates together in a calm and considered way. It has been great to witness the results and be able to reflect on the harmonious nature design from an initial idea to a fully realised, complete and colourful show existing in an unusual space. and now: some words from Fred, herself. AB // Why did you choose to present themes of wellness and mindfulness in a gallery context? FB // My work and my life are one united thing. Incorporating my artistic interest into wellness has been a real mission and manifesto. I’ve always created otherworldly spaces to transport visitors to my dream dimension. Exhibitions should provide an experience that leaves a lasting impression. I wanted to make it all inclusive and provide access to a healing destination that might not normally be known about or accessible. I combined a mindful theory with my aesthetic for shape and colour to unite these elements. AB // Can you explain the concept of chromotherapy in relation to positivity and mental wellbeing? FB // I’m really into seasons and being in touch with witnessing the power of nature’s force to appreciate the bigger picture. Living in London we can be totally disconnected, immersed in our constructed urban landscape. We’re exposed to the same artificial environment 365 days of the year. I believe it’s vital to see the green shoots and glistening buds of Spring as much as the amber gradients of the leaves in Autumn. If we are lacking this range of sources, we have a very narrow view of our place in the earth’s equation. In addition to this the majority of the day we spend looking at screens which needs addressing to find an antidote for that unhealthy absorption. AB // Harmonics in Space features ‘Healing Spheres’ which allow visitors to directly interact with the sculptural elements on display. What is the purpose of including these interactive exhibits? FB // My exhibition was inspired by Rudolph Laban’s theory ‘Harmonics in Space’ of how our bodies are formed of polyhedral shapes within the environment. The first and smallest of the polyhedral is the tetrahedron, located at the centre. Vibrations here are closely related to breathing and our intense awareness of being alive. I believe that through constant computer work and hunching over devices, this tetrahedron gets blocked. I want visitors to use this space as an opportunity to stand, breathe and explore. By moving around to discover the interactive elements, you can expand your chest to recharge the whole body to be responsive and reconnect. This environment offers an interplay between the conscious and unconscious levels of the psyche, stimulating the imagination and releasing creativity. AB // What motivated the desire to shed light on the body and, in particular, the negative effects of desk-culture on our physical health? FB // I’m seriously concerned about our future generations. When I'm running through the city, I see parks of parents with push prams looking at their phones and not the child. That's neglect. That's teaching a new life that communication is through a device. I can already see a lack of eye contact when I speak to young people and I think it really impacts their confidence. The most basic forms of understanding each other is through one-on-one contact [...] People are becoming more isolated and threatened by "otherness" because it's no longer part of their own experience. We need to be awake to what's in front of us every day and not lost down the portals of our interface. It's the face in front of you on the train that will teach you much more if you're open to it. I honestly think we are on a 180 degree return to being Neanderthals: stooped over, mumbling with no language and/or dialogue. AB // How would you like visitors to the exhibition to feel during their experience at Harmonics in Space? FB // LOVE. Absolute love. I've poured all of my love into making this, so I want everyone to bottle that up to take away with them. I have very vivid memories of visiting certain exhibitions which have deeply affected me, so if I can offer a similar experience, than I feel that I've fulfilled my duty to the NOW Gallery. They are so supportive to an artists' vision that this is truly a dream opportunity - an opportunity to create pure magic. Feb 28th - April 29th, 2018.